Welcome to my first of 4 gift guides for 2014! Today is all about that special guy in your life, whether it be a brother, boyfriend, husband, father, grandfather, cousin, GBF, guy friend (you get the drift...). Last year I gifted my brother a watch for Christmas and in my opinion a watch is a pretty safe bet for a gift. Since there are so many options out there (dressy, sporty, casual, etc. ), it's easy to scoop one up for almost any guy on your list. I'm really loving the new Victorinox Night Vision watches (if you caught my first post about the new brand here you can see why they're so great!) - and especially the green color option. I don't know why but lately I've gravitated toward dark green as a new neutral. I've also included a few other tech gadgets and clothing/accessory options. I have to confess, I threw the camo tote in because one of my best guy friends has one and I'm completely obsessed with it (so much that I've thought about buying one for myself!). 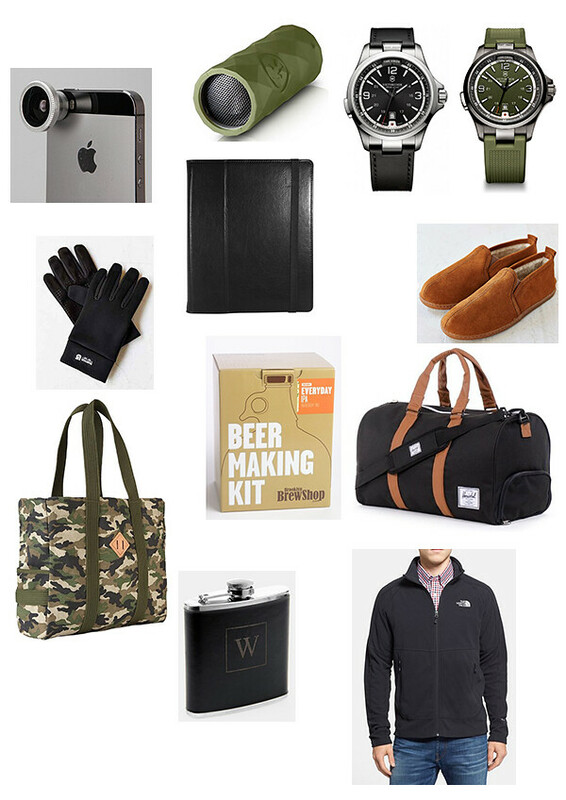 My go-to retailers for men's gifts are Gap, Nordstrom (especially the under $100 section), Brookstone and Urban Outfitters (there's some amazing, quirky things on UO right now!). Would love to hear what you're planning to scoop up and who you're shopping for! This post was sponsored by Victorinox to celebrate the expansion of their watch collection. All opinions expressed are my own and thank, you for supporting the brands that make this little blog possible.